Jennifer for allowing us to print this article as it originally appeared in the April 1, 1999 Arabian Horse Times. Will you be ready to claim your share share of the additional $10,000 in prize money available to performance horses at the 1999 Egyptian Event? In addition to having the right horse, competitors must have knowledge of the class requirements. Following are the class specifications for Show Hack, along with some helpful training tips. A Show Hack horse is neither a dressage horse or English pleasure horse of the Arabian division. Elevation and high knee action are not emphasized. A Show Hack must be balanced and show vitality, animation, clean fine limbs, presence and supreme quality. Soundness is required and blemishes may be penalized. Obedience is of prime importance. The Show Hack is a suitable section for the well-trained animal. Competitors enter at a normal walk in a counter-clockwise direction. Light contact must be maintained, with all reins, at all gaits. The judge(s) are required to consider the performance at each gait equally on adjudicating the class. The collected and extended gaits must be performed. Mounting and dismounting may be required. The Show Hack shall perform with a noticeable transition between the normal, collect and extended gaits. Horses on the rail may be asked to halt and rein back at the discretion of the judge(s). Walk - a four beat gait, true and flat-footed. The normal walk should be unconstrained and energetic, yet quietly forward. When moving to the collected walk, the strides are shortened and higher than at the normal walk. The head approaches the vertical, but should never move behind it. Pacing is a serious fault, which will be penalized. During the transition to the extended walk, light rein contact must be maintained while the horse lengthens its frame and stride. The extended walk should cover as much ground as possible without rushing. Trot - a two beat gait, free-moving and straight. The normal trot should be light, balanced and cadenced with the rider posting. The collected trot requires a shorter and lighter stride, maintaining impulsion and balance. The neck is raised and arched higher than at the normal trot as the head approaches the vertical line, without moving behind it. The rider is sitting at the collected trot. Maintaining the same cadence as the normal trot, the extended trot is performed at medium-speed, with the stride lengthened as a result of greater impulsion from the hind quarters, and the rider is posting. Canter - a three-beat gait, straight on both leads. The normal canter is light with even strides and the horse should move into the gait without hesitation. 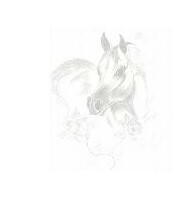 The collected canter is marked by the lightness of the forehand and the engagement of the hindquarters and is characterized by supple, free shoulders. The neck is raised and arched higher than in the normal canter as the head approaches the vertical line without moving behind it. The extended canter is performed with the same cadence as the normal canter with the stride lengthened as a result of greater impulsion from the hindquarters. The horse should remain light in the riders hand as it lengthens its frame. Hand Gallop - The hand gallop is to be performed with long, free, ground-covering strides. The distinction between the hand gallop and the extended canter is the latter being the ultimate linear extension of stride within the hand of the rider. A decided lengthening of stride should be observed while the horse remains controlled, mannerly, correct and straight on both leads. Extreme speed will be penalized. The bridle should be light, of show quality, in either a kimberwick, snaffle, snaffle, pelham or double. Browbands and cavessons, other than the hunter or dressage types, are prohibited. An English saddle of any type is required. Acceptable girths include leather, white web, nylon string or suitable material. The saddle pad should be either the hunt or dressage varieties. Figure-eight , drop or flash nosebands, boots, leg wraps, martingales and breastplates are not allowed. Horses may be shown with a braided mane and tail secured with tape, yarn or rubber bands. Decorations are prohibited. Acceptable Hack attire consists of conservatively colored coat, breeches, hunting cap or derby. Formal attire, usually worn after 6:00 p.m. or in a championship class, may consist of white breeches, top hat and tails, spurs, whip or crop (optional at the riders discretion). Stripping of the horse is optional, however it MUST be stated in the prize list if the horse is to be stripped. One groom, suitably attired, is permitted to assist the rider for stripping when conformation judging is required. To be eligible, a horse have been entered and judged in a qualifying class in the Show Hack section of the show. Horses to be shown at the walk, trot, canter and hand gallop; collected, extended and normal gaits to be called for; to stand quietly and back readily. 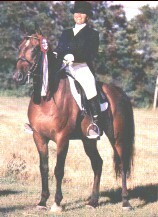 1998 Eastern Canadian Breeders' Champion Show Hack. When selecting a potential Show Hack, consideration must be given to the criteria of the class. A Show Hack must be able to perform at it's peak for extended periods of time, without hesitation. The mental suitability for this division must is of equal importance to physical condition and athletic ability of the chosen individual. A well-trained horse is usually the best prospect. When conditioning a Show Hack, attention should be given to the length of the time the horse and rider will be required to perform. Classes will often run 20 - 40 minutes, depending on the number of entries. You'll want to ensure that both you and your horse have the stamina to finish the class. Time should be taken to school your horse at each gait, moving up and down through the transition. The training of Show Hack requires time and patience, but is very rewarding. Formal attire is not mandatory, however in the higher levels of competition, it is definitely an asset. To keep your gloves clean and white, store them in a bag and only put them on before entering the ring. Braiding the mane and tail is important as it provides the Show Hack with a formal appearance suitable for the division. A wide variation of braiding is accepted. For a professional look, incorporate some white tape into your braids and add a pattern on the hindquarters. Horses should be shown in a full bridle. Adding brass fittings to the bridle is another way to compliment the formal image of the Show Hack. Keep in mind, when choosing a bridle of this nature, many Arabians have small heads, which are easily overpowered with excessive brass or to heavy of a bridle. When selecting bits, I prefer to use larger ringed snaffles with short-shanked curbs. In my experience, this design provides the best results for achieving the desired headset for the division. Saddle pads should be rectangular in either black or white. Black pads are a personal favorite of mine on dark colored horses. Regardless of the appointments used, it is imperative that the horse be well groomed, the tack spotless and the exhibitor's attire clean and in good condition. Exhibitors want to exude confidence throughout the class, thus providing the judge(s) with a reason to look their way. Show Hack can be very demanding on both horse and rider, but to win a class is a wonderful feeling. It is both rewarding and satisfying to place well in this division. Enjoy yourself and have fun.